It seemed only fitting to kick off the first day of fall with an easy pumpkin recipe! 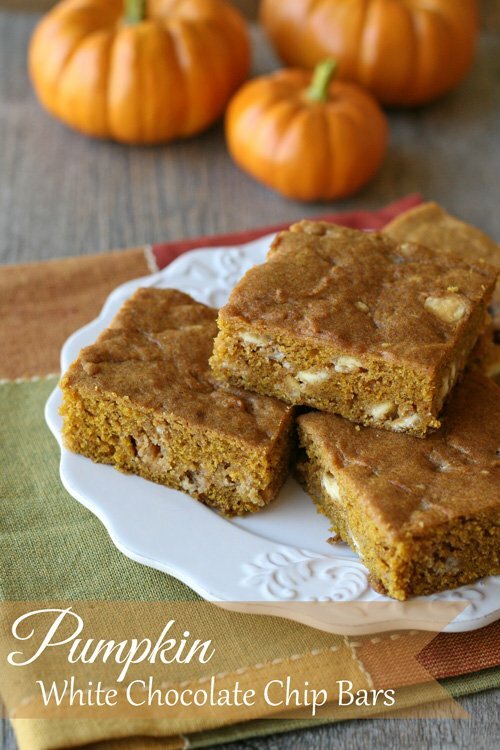 These Pumpkin White Chocolate Chip Bars are super simple to mix up and are a perfect snack cake, or breakfast treat. 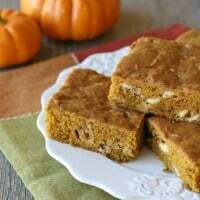 These bars have a mild pumpkin flavor, a nice balance of spices, and lots of yummy white chocolate chips (my favorite part!). 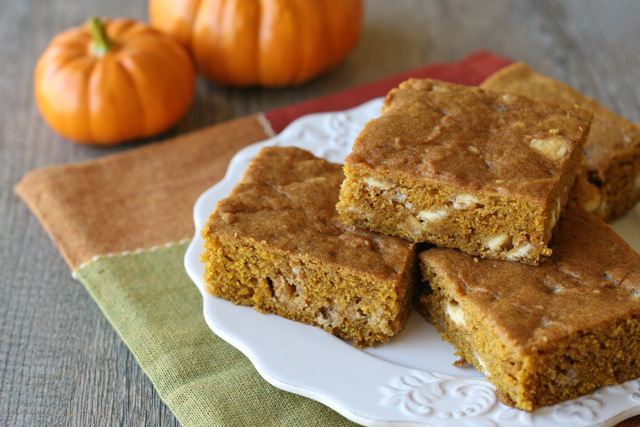 These bars have more of a cake texture than cookie, so if you want to call it Pumpkin Snack Cake, go for it! 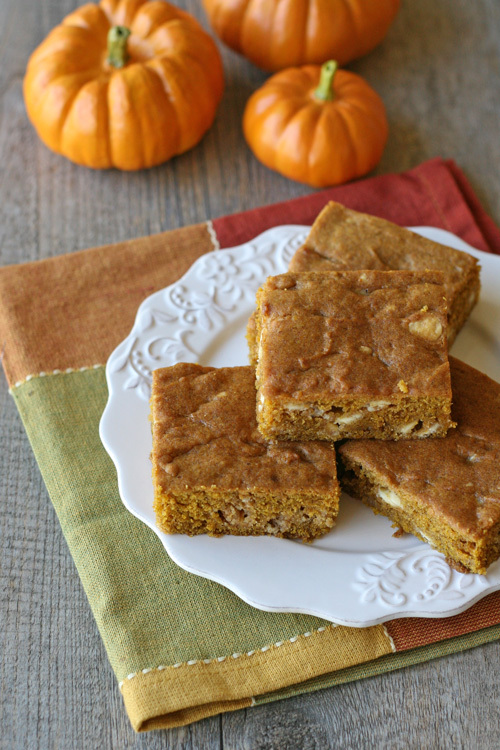 These simple fall bars come together quickly and will disappear just as fast! Prepare a 9"x13" pan by lining it with parchment paper, or greasing it with bit of butter. In a large bowl whisk together the flour, baking soda, salt and spices and set aside. In another large bowl whisk together the melted butter and sugars. Add the egg, then vanilla and pumpkin and blend together well with the whisk (no need for an electric mixer). Pour the bowl of dry ingredients into the bowl of wet ingredients, add the white chocolate chips and blend together with a spatula or wooden spoon just until fully incorporated. Scoop the batter into the prepared pan and spread it evenly in the pan. 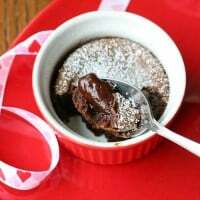 Bake 25-30 minutes, or until it appears set and a toothpick inserted in the center of the pan comes out clean. Cool fully, then cut into bars as desired. Use 1 Tablespoon Pumpkin Pie Spice in place of the individual spices, if desired. Feel free to use semi-sweet chocolate chips in place of the white chocolate, if desired. Final Recipe by Glorious Treats, adjusted from Martha Stewart . Ready to kick off your fall baking? oh wow! these look positively sinful! do you think the recipe would also work with dark chocolate chips? Uhhhh YUM!! Just as I was about to make the pumpkin muffins doughnuts I saw this!! I don’t have any white chocolate though so I’ll make it next time. These bars are suuuuuuper!! Yum! Oh, yummy! These a great, love the white chocolate! Pumpkin, cinnamon, nutmeg – all great autumn flavours. 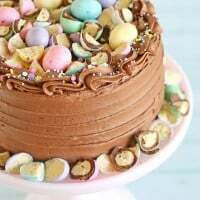 I’m on the look-out for some seasonal cakes – thanks for the recipe! These look delicious! Love the addition of white chocolate. yum! I feel like I need to wait until October 1st though to make anything with pumpkin. Same with decorating with pumpkins on the porch…not til October 1! I love me some pumpkin! These look wonderful!!! Pumpkin and white chocolate sound so decadent together! These bars look amazing. SO simple, yet wonderfully elegant. Pinning! 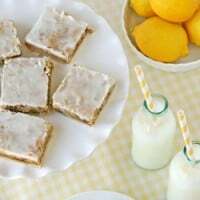 These do look delicious! I love Fall baking! These were soooo good! Made them last night and my DH and I ate 1/3 of the pan by ourselves. I packed up the rest for him to take to work this morning so we didn’t eat the whole pan! I love anything pumpkin and the combination of pumpkin and white chocolate is perfect. It all looks so delicious. I don’t know which one to try first! It all looks so delicious. I don’t know which one to try first! Maybe I will try one a week. This blog is one of my favorites ! such cute treats . 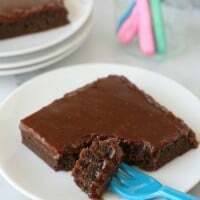 I made this twice already, and they were a hit! I’m now looking to try your other recipes. Thank you for posting this! May I know if I can use home made cooked pumpkin puree instead of canned pumpkin puree? Hi Lyn, Generally home cooked puree is not as consistent in sweetness or flavor and is also a bit more watery. Feel free to experiment, but make sure to let the puree drain a bit before measuring it. I baked something that looks like the photo in ere… They smell great and taste amazing and i did use homemade cooked pumpkin puree since we dont have canned pumpkin … Thx again! These were on point. EXACTLY what I was looking for. The pumpkin spice flavor is there all the way! Mine didn’t seem to cook as well in the middle and I was wondering if you had any hints on how to get it to cook more evenly? Add more flour? Less butter? More cook time? Ps- even though it was softer in the middle, it did not stop – or slow- the family from eating the entire thing. I will be making it again! I made these and they are wonderful but mine turned out doughy, especially in the middle … I was wondering if the amount for the butter should have been only 1/2 c? I did use butterscotch chips instead of white, but don’t think that made the difference … Any thoughts?